Double Cross, brought to the Nintendo Switch by developer 13am, is one of those games that makes a lot of promises starting out. From the first hour of the game, you are presented with an action platformer infused with both RPG elements and an investigative component that promises to mash up several genres into a single package. But how far does Double Cross really drift away from its core platforming gameplay? And can this game really combine all these elements into a single, satisfying experience? Rather than sending the player marching through time or blazing trails across the universe, Double Cross follows the story of a crime-fighting organization that travels between different dimensions. An infinite number of earths, with an infinite number of lifeforms, are policed by the Regulators of Interdimensional Frontiers and Technology. Among the worlds monitored by RIFT, you’ll find some like our own, with both primitive and advanced technology. Others are futuristic landscapes dominated by robots or sentient goo, while others are populated by cat people, dinosaurs, or giant, tentacled monsters with a taste for human flesh. RIFT ensures that dimensions with the technology to explore the multiverse use that technology wisely, and that creatures and people who accidentally cross between the worlds are recovered and returned home safely. However, as with any organization, nothing is perfect. Double Cross follows one of RIFT’s rising agents, Zahra, as she tries to solve a conspiracy that spans multiple worlds, instigated by a traitor within her midst. 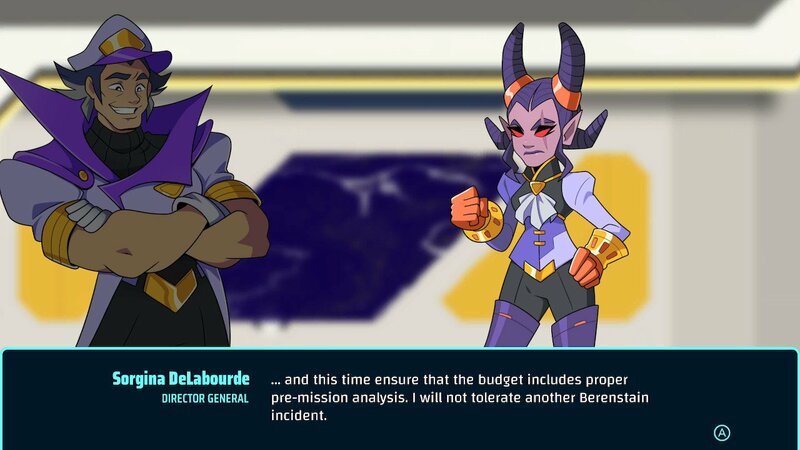 Throughout her adventure, Zahra discovers secrets about her fellow agents, sees the dark consequences of RIFT’s mission, and finds herself questioning the efficacy of her organization. Thrown into this dimension-hopping intrigue is the presence of Zahra’s alternate self, dubbed Rogue Zahra, who wishes to destroy all of RIFT (traitors or otherwise) for her own reasons. While the story of Double Cross never reaches the breadth and depth found in mainstream RPGs, it deftly manages with what little space is allotted in an action platformer. Characters are colorful and entertaining, while also able to invoke strong emotions in the right moments. Double Cross’s art direction follows a clean, modern style that provides colorful and animated characters, backgrounds, and animation. While not particularly unique compared to much of the work one could find from young artists online, the professionalism and execution found in Double Cross is top notch. Most of the dialogue in the game is delivered by static character artwork that changes between set expressions to communicate their emotions. Each piece of character art is wonderfully expressive, with game developers managing to get wonderful expressions even out of giant tentacle monsters or dinosaurs with ease. Meanwhile, the game’s animations and score are nothing to write home about. We love good music at SwitchRPG, and Double Cross’s soundtrack is nothing you would find yourself humming when the game switches off. That’s not to say the music is bad – quite the opposite – but it does nothing to set itself apart from the crowd. The same could be said for the in-game animation, as character models are comparatively simple compared to the artwork presented in dialogue. The name of the game is solid, but unremarkable in this department. As Zahra sets out to various alternate Earths, she will embark on customized missions to help unravel the mystery of RIFT’s betrayal. Each mission follows the standard action RPG formula established by games like Mega Man. The player may set out into any mission they choose at any time, though missions are marked with stars to indicate their difficulty. Completing each stage involves exploring a fairly linear stage, completing platforming challenges, fighting enemies, and pausing here and there for story beats. At the end of each stage you’ll be left with a new clue to help solve the case. 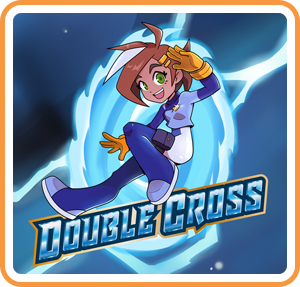 Easily Double Cross’s strongest selling point is its platforming. Zahra comes equipped with a proton slinger, which allows her to lasso special energy nodes scattered throughout each stage, propelling herself forward. Combining the proton slinger with a wall jump, slide, and a few other movement abilities picked up along the way, the developers have crafted a series of well balanced stages that will put your skills to the test. The game’s introductory level is almost entirely centered around helping the player master these movement options, and the subsequent levels all introduce new challenges in how to navigate the map. These movement options result in sometimes frantic, sometimes meticulous challenges that always leave you feeling satisfied with your growing skills. Combat, meanwhile, has you punching and kicking your way through hordes of monsters who offer little in the way of attack variety. Each world has their own set of unique enemies, though most have attack patterns that are relatively easy to avoid. Dinosaurs dash up, pause, then try to chomp you. Slimes will simply try to absorb and eat you. A few unique monsters may throw projectiles or drop even smaller monsters for you to fight in your wake, but nearly all of the standard fare can be killed in one or two rote combos. The real challenge comes from larger monsters that appear periodically, usually in locked rooms where you’ll face two to three waves of enemies. These larger monsters have unique attack patterns and early on function as a sort of mini-boss, though they can be defeated quickly through proper management of Zahra’s energy bars. Each time Zahra defeats an enemy, she collects a small amount of energy from them, which can be used for a variety of skills. 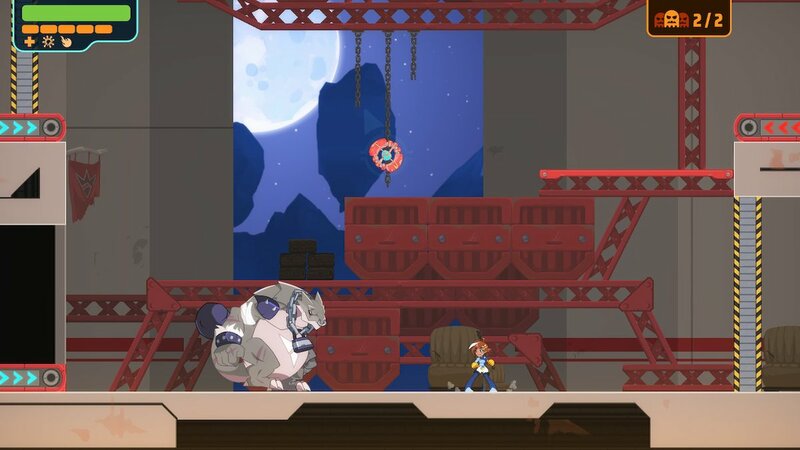 Holding the A button will spend one bar of energy to refill Zahra’s health, while hitting L will cause her to send out a shockwave, blasting back nearby enemies. The most powerful attack in her arsenal, however, comes from hitting R and unleashing a hadouken-like attack that deals massive damage and will stun the larger mini-bosses. By carefully curating your number of energy bars throughout a stage, you should always be prepared to quickly take down one or two of these larger monsters. While each mission follows a linear path to Zahra’s objective, opportunities for exploration abound. 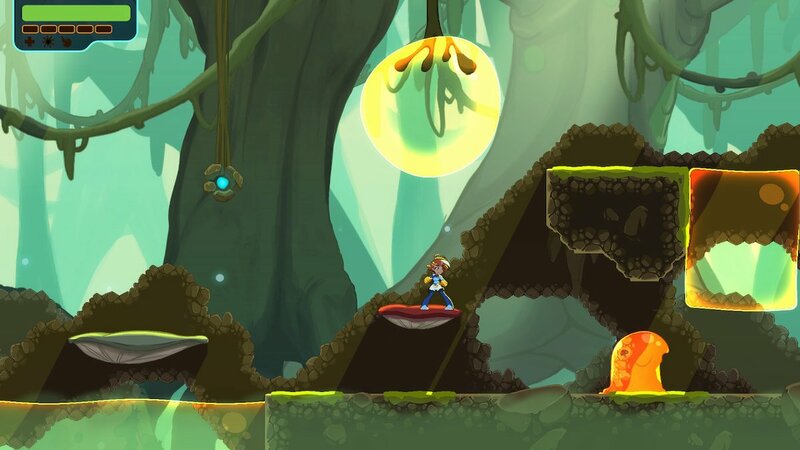 Scattered through each stage are crystals, aptly named “upgradium,” which can be used to enhance Zahra’s abilities. Each piece of upgradium acts like an experience point, helping Zahra level up and learn new skills. Permanent skills, gained every level for the first seven levels or so, provide lasting enhancements that the player will always have access to – usually in the form of some new powerful aerial attack. Meanwhile, leveling up also provides a series of optional skils, which can be equipped to one of three slots in Zahra’s inventory. These skills may increase her health, provide additional energy when killing enemies, or even activate a shield that protect Zahra from attacks. Gathering upgradium plays perfectly into the game’s excellent platforming design. Crystals are cleverly hidden in both easy to see, but hard to reach places, as well as in tricky locations that require creativity and attention to detail to notice. The game constantly keeps players on their toes and on the lookout for upgradium that may be hidden away in plain sight. Even with a great eye for detail, I never once collected every piece of upgradium on a single run through a level – which provides a great means of extending playtime for those players who love a good collect-athon. Conveniently, the game will show how many crystals are available in each stage, and will highlight the order in which the crystals can be found, helping players identify exactly where the missing pieces of upgradium may be. The final piece that makes up Double Cross’s gameplay is, of course, solving the actual cases. Zahra’s home base, RIFT Headquarters, is populated by scientists, agents, and administrators who may all be interviewed about given pieces of evidence, helping Zahra identify who the traitor is and what their master plan may be. In addition to these required conversations, Zahra also has the option to speak with various members of her team “off the books,” learning more about their personal history, wants, needs, and life goals. From these interactions, the player may be given a few additional hints as to who the traitor is, and will discover a few subplots along the way. As with combat, the investigative side of gameplay is fairly straightforward, but it does reward the player nicely for thinking outside the box in a few places. However, if you’re looking for some kind of Phoenix Wright level of investigation, you may be disappointed. While Double Cross doesn’t break any new ground in game development, it regardless offers an honest and engaging adventure from start to finish. What this game does, it does well, providing excellent art direction, satisfying platforming, a sometimes humorous, sometimes heartbreaking story, and just enough exploration and customization to encourage repeated playthroughs. This action platformer – infused with a measured dose of RPG elements – delivers on exactly what it promises: a fun adventure for $20 or less. Sounds a little too light on RPG mechanics for my personal tastes, but absolutely dig the art style! Since I enjoy other metroidvanias, I still might pick it up at some point. 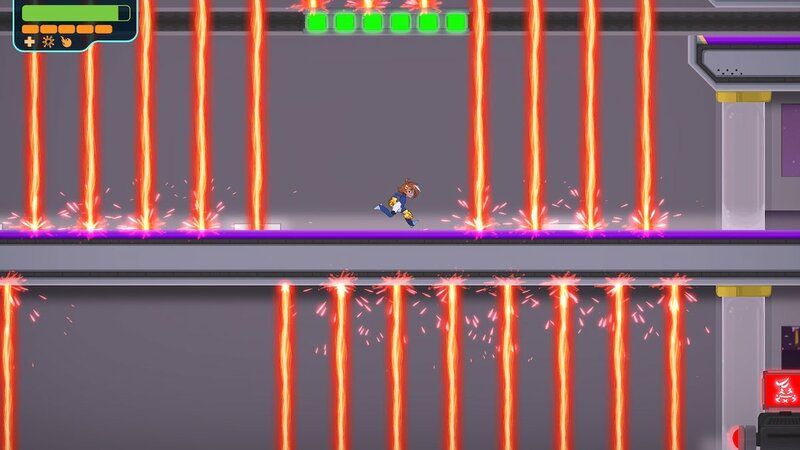 It’s definitely closer to a Mega Man game than a Metroidvania. Still a solid, fun experience from start to finish, though.